Melbourne will keep you on your toes, be it our 'four seasons in one day', stunning parks and gardens, vibrant laneways and arcades, world-class arts and sports events or appealing mix of old and new architecture. Explore with us! 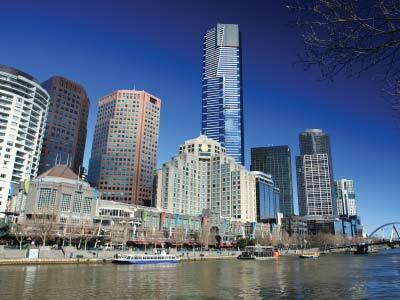 Our Melbourne tour will introduce you to some of the city's best attractions. Tour through 'Little Italy', admire beautiful architecture of Melbourne University and surrounding homes of East Melbourne, pass by St Patrick's Cathedral and visit Fitzroy Gardens. We'll take a guided walk through a few of our favourite laneways and arcades (a hidden gem to visitors) and time to wander at Queen Victoria Market*. After your coach tour, take a relaxing and scenic Yarra River cruise complete with a gourmet boxed lunch as you enjoy stunning views of the city skyline. * When the market is closed we will extend laneways & Fitzroy Gardens stop OR visit the MCG on MON and WED.
Tour concludes near Flinders St Station/Southbank. Pending tide conditions on the river, the cruise may go in the opposite direction which explores Melbourne's picturesque gardens, parklands and some of our famous sporting arenas.